SENTIMENT on the local bourse weakened somewhat last week. As we edge closer to the extended weekend to celebrate the Lunar New Year, stocks may continue to drift lower. Given the myriad uncertainties and increased volatility in global financial markets, investors will likely want to take some money off the table ahead of the long break. This week will be a very short trading week. The local stock exchange will only trade for the morning session on Wednesday and is closed on Thursday and Friday. The FBM KLCI traded lower for four straight days before recovering some lost ground on Friday. It closed 12 points lower for the week, paring gains for the year-to-date to 2.3%. As mentioned previously, local stock prices and the ringgit appear to be moving in lockstep with oil prices of late. As oil prices see-sawed through the week, so did our market and currency. The Brent crude started the week above US$59 per barrel, fell as low as US$56 mid-week before bouncing above US$60, at the point of writing. The ringgit mirrored this trading pattern, rising as high as 3.56 to the US dollar and as low as 3.62, ending at 3.58 last Friday. Although there is anecdotal evidence that drilling activity has slowed somewhat in the US (as seen in the falling rig count), stockpiles in the country hit fresh record high last week. The global market is similarly facing a supply glut on the back of sluggish economic growth and demand. Oil prices will find it hard to sustain a rally as long as the market remains in excess supply. For the current week, investors will be watching closely the outcome of ongoing negotiations between Greece and the rest of the European Union. The country’s new anti-austerity government is trying to negotiate softer terms on its bailout programme. Despite the current stalemate, most market analysts still expect a compromise will be reached to avoid a messy Greek exit from the eurozone. In other notable news, yields on the benchmark US treasuries jumped to nearly 2%, up from 1.68% at the start of the month. This follows stronger than expected US labour market report for January, which lifted the probability of an early interest rate hike. Yield gains were, however, capped as uncertainties in the eurozone led a flight to safety. External developments such as in the oil market and the EU will continue to influence sentiment on the local bourse. On the home front, the key concerns remain our economic and corporate earnings outlook. In this respect, I do not foresee any imminent catalyst that will sustain higher prices. Bank Negara released 4Q14 GDP numbers last week, which came in at 5.8%, ahead of market expectations. This brings full-year growth to 6%, stronger than the 4.7% in 2013. However, growth is expected to soften in the current year, to between 4.5-5.5% — more likely than not near the lower end of this range. The government surprised by announcing a 2.25 sen per unit reduction in electricity tariff last week — contrary to indications (that tariff will stay unchanged) in recent months. The abrupt turnaround in the tariff decision highlights persistent regulatory risks for Tenaga. Shares for Tenaga was hard hit by the tariff reduction — even though the passing on of fuel savings to consumers should be neutral for the utility. I put this down to analysts placing irrationally high expectations on Tenaga in the absence of a clear cut big cap winner — hence the sell off we saw. Along the same vein, I believe prevailing market expectations for 2015 remain too optimistic. 4Q14 corporate earnings results released, so far, have been tepid. Earnings will continue to disappoint as the year unfolds, marked by slowing consumption and rising costs — lower petrol and electricity prices will only partially offset higher costs from GST and weaker ringgit. Stocks in my portfolio fared comparatively well last. Total value of my portfolio was up 1.75% for the week, against the benchmark index’s 0.7% decline. 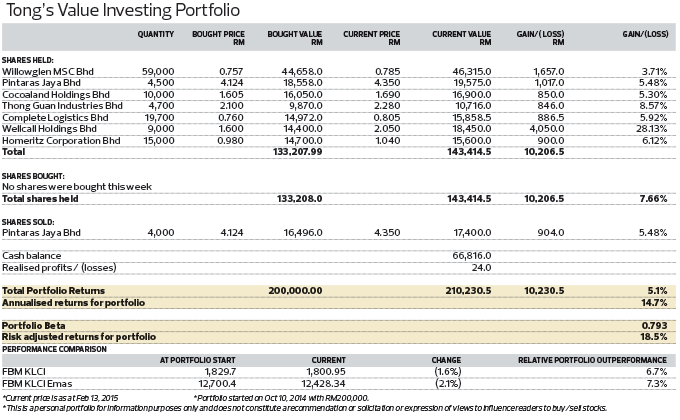 The portfolio is now up 5.12% since inception, outperforming FBM KLCI, which has fallen by 1.6% over the same period. I sold 4,000 shares in Pintaras at RM4.35 per share, which I acquired at RM3.98 about a month back. I continue to like to the company for its strong business model and outlook (Fundamental 3/3, Valuation 2.1/3). But given the 9.2% gain in one month, I decided to lock in some profits. I still hold 4,500 shares in the company. My portfolio is now about 67% invested.